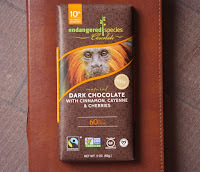 When I saw a bumper sticker this morning that read "Feel the Bern" (referring to presidential candidate Bernie Sanders), I was reminded of today's Dark Chocolate with Cinnamon, Cayenne and Cherries bar from Endangered Species Chocolate (Indianapolis, IN). And by that I mean, I was still feeling the burn from this spicy hot, dark chocolate bar. And, while it did say cayenne clearly on the label, I was unprepared for just how red hot it would be. Before taking a bite, I could detect a pleasant, sweet, slightly spicy aroma. After I took a bite, fire alarms went off in my mouth and I couldn't taste anything. 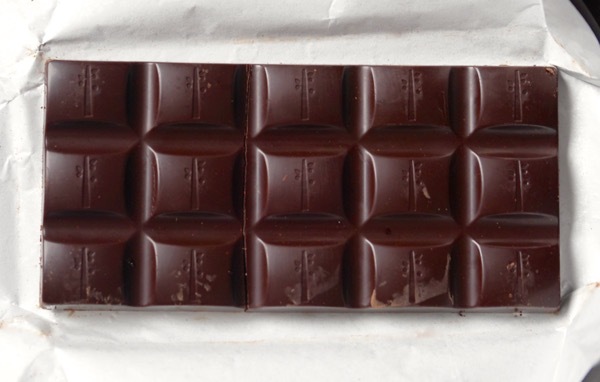 Was this bittersweet 60% cocoa chocolate bar just lacking uniformity in flavor? I don't know. I was afraid to take another bite to try to find a cherry to help cool things down or at least balance the burn. But, if you're an adventurous soul, or love hot-spicy food, this might be just the ticket for you. About four minutes after I bit into this chocolate (not an exaggeration) my mouth seemed to finally recover enough that I caught an aftertaste of cherry and cinnamon, and detected a slight grittiness that could have been the cinnamon. This bar was certified gluten free, vegan, kosher, Non GMO verified—and contained 92% Fairtrade ingredients if I read the small print on the wrapper correctly. Now, on to the animal of the day, a monkey. There was a photo of a Golden-Headed Lion Tamarin (monkey) on the label of today's bar. This Tamarin lives in the canopy forests of Brazil and is decreasing in numbers, due to habitat destruction, "human interference" and poaching. 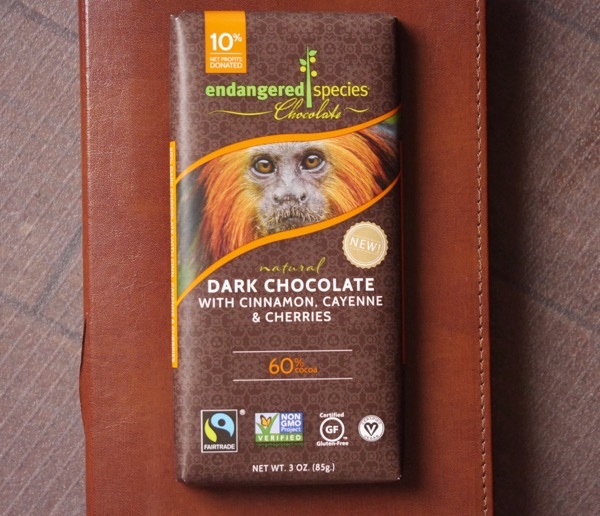 For many years, Endangered Species Chocolate products (made with cacao "from small farmers and co-ops in West Africa") have featured photos of different animals and birds that are under threat. In addition to helping to increase awareness with product packaging, the company contributes 10% of their net proceeds to organizations (via their 10% GiveBack Partners program), such as The African Wildlife Foundation and The Xerces Society that is dedicated to conservation. I love these cayenne, cinnamon and cherry bars so much--but I can't find them any more! Not even on Amazon. Did the company stop making them?